Today is November 11, a day in which we honour and remember those who fought for our country, died for our country, and continue to put themselves in harms way to protect us. That includes the brave men and women of our armed forces, and also our great police and fire fighters. In Canada and the Commonwealth, today is known as Remembrance Day. I enjoy the service held at the Strachan Avenue Burial Ground outside of Fort York. It is the city's second military cemetery, the first being located in Victoria Square at Portland and Wellington. Trumpeter Robert Divito played O Canada to begin the service and God Save the Queen to end it while the crowd sang along. The Reverend Jan Hieminga did the prayers and readings. He noted that there were many children in the crowd and told his own personal story of growing up in fear in Nazi occupied Holland. His family were in hiding from the Nazis as they were after his father. He said is forever grateful that the Canadian Army came in to drive them out and rescue his country. The story was for children but I was moved. I feel it is important to take time out on November 11 each year to remember. Here are members of Teena's and my family who have served. My dad, Ken, who fought with the Canadian Infantry in World War Two. 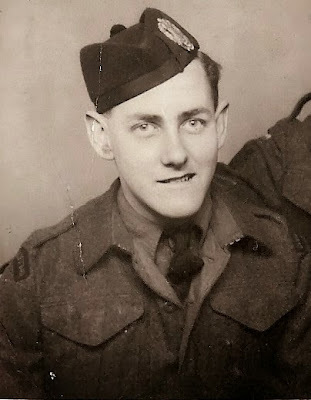 His dad, my grandfather, Sid, who fought with the Royal Newfoundland Regiment in World War One. 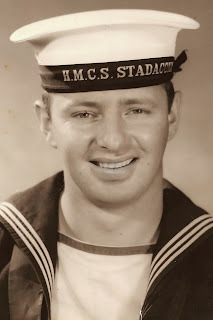 Teena's dad, Frank, who served with the Royal Canadian Navy.